Celebrate the enduring appeal of Pooh and his adventures in the Hundred Acre Wood with our creative ideas and activities to help immerse your pupils in the magical world of Christopher Robin and his menagerie of animal friends. Use the annual Winnie-the-Pooh Day on 18 January to focus your celebrations and say happy birthday to Pooh. Alternatively, any day could be a Pooh day, as we seek to celebrate and explore the creative storytelling process and encourage the imaginative A.A. Milne inside each one of our pupils. Designed as a whole-day celebration, this resource guides you in spending a morning immersing pupils in the world of Pooh and his friends in preparation for an afternoon of story invention. Pupils are supported to develop their own Hundred Acre Wood tale to rehearse and share orally with peers and parents as they introduce a new character of their own to join the band of lovable friends. a map of the Hundred Acre Wood. The resource is designed for Key Stage 1 pupils and can be delivered either as a whole-day celebration or more flexibly across several days with an additional writing outcome. To support extension of ideas, vocabulary and prior knowledge, a great idea would be to combine pupils from Years 1 and 2 in mixed classes for the day or even recruit some avid Pooh fans from Key Stage 2 to come and share in the story creation process. Key Stage 1: writing composition, reading comprehension and enjoyment, spoken language and vocabulary development. 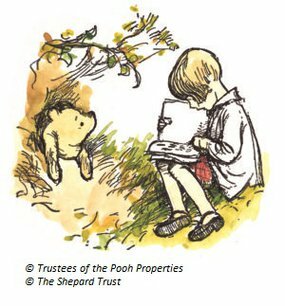 With thanks to The Pooh Property Trust, The Shepard Trust and Egmont Publishing for their supporting resources and images. Find a storyteller using our listings tool.